A while ago people used a basic garden hose to clean their pets. While this may work, it is not a great way to give your furry friend a bath. Taking your dog to an expert for professional cleaning is not a solution either as it is costly. As you probably know, dog bathing is not simple without the right tool. However, similar to the way we groom, this is crucial to ensure the hygiene of your dog. This is where the best dog showers come in. These innovative equipment come with features that allow for deep cleaning without hurting your pet. They also come with tools that allow your pet to remain calm. In this guide, we have reviewed the best models available on the market. This should help you have an easier time when picking the model that suits your needs. 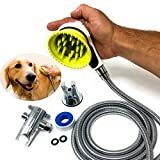 Engineered from high-quality materials the Waterpik PPR-252 shower attachment makes a great choice for grooming your dog both in the outdoor and indoor use. We love the professional grade contoured wand allowing it to wash dogs of all sizes and shapes. Thanks to the standard sized head, you can attach this unit to your showerhead or outdoor garden hose. Besides, this unit comes with a unique water comb spray that offers maximum cleaning coverage and enough power for rinsing thick fur. The Aquapaw Pet Bathing Tool is the first world wearable combination sprayer that doubles as a scrubber that can be turned on and off with a press of a button. 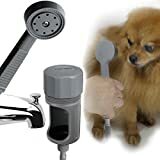 This bathing tool offers you with total control over your pet and flow of water during the bathing process. This eliminates much of the time and the fuss involved in bath time. By doing so, you will save your time and eliminate the stress that comes with the process of bathing your pet. The Waterpik PES-142 pet dog shower is not only a great choice for indoor but also outdoor use. 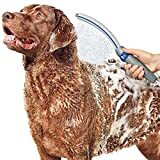 This makes it easy to clean and groom your dog in the comfort of your home. This model comes with a unique watercolor spray, providing maximum cleaning coverage. The unit comes with a water flow control lever that lets you minimize the water pressure when cleaning sensitive areas. Besides this unit comes with adapters allowing you to use the indoor utility sink indoor as well as the outdoor hose. 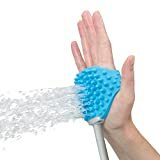 Combining glove and water sprayer, this pet bathing tool will allow you to groom your pet at home effortlessly. The model will not only allow you to bath your pet but also brush the pet’s hair after grooming. It is a perfect choice for all pets regardless of whether they have short, long, or curly hair. Besides, this model comes with a grooming kit that allows you to brush away dirt, loose hair, and dander. This is an expert grade dog shower designed to clean all types of dogs and other pets. This model is well contoured and comes with a water comb that ensures deep penetration on your pet ’s thick fur. Additionally, this unit can easily connect to your hosepipe allowing you to use it in the outdoors. It also attaches to existing showers allowing you to use it indoors. 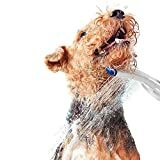 Featuring an eight feet hosepipe, this Rinse Ace shower sprayer gives you with the flexibility you need when grooming your dog. This sprayer comes with a smooth full spray that allows you to thorough cleaning. Besides, the unit also comes with an intense spray that allows you to target the delicate areas. Grooming your furry friend is an important part for human-pet bonding. This also allows you to examine your pet for any skin condition, allowing you to visit a veterinarian before the condition worsens. Besides, purchasing this shower kit will allow you to save a lot of money that you could use for professional cleaning. This shower kit comes with a perfect design that allows for uniform cleaning. Besides, this unit comes with adjustable water pressure ensuring an enjoyable and deep cleaning. 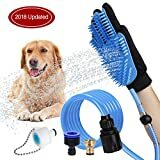 If you are looking for a complete dog bathing set, you should go for this model. This is a handheld sprayer that comes with superior features, allowing both you and your furry friend enjoy the bathing experience. This unit comes with various adapters that allow you to connect to the outdoor garden hose or warm bathroom water for a comfortable bath during the summer. What makes this unit stand out is that it is made of high-quality materials that ensure leak free performance and long lasting service. Taking your pet for professional cleaning is time-saving. However, this is a costly venture. With the Smarter Fresh pet shower sprayer set, you can save money and bond well with your pet. This model comes with a simple attachment that allows you to use either your bathroom tub or garden hose. Besides this unit comes with a three water flow settings as well as an easy glide lever to control the water pressure. Maci- Fresh pet shower makes your pets shower time calming, pleasant, and quick process. Your furry friend will love the new bathing experience thank the incredible performance. The unit combines a bath scrubber together with a water sprayer all in once. Another great feature that makes this unit to stand out is the quick connect feature that allows you to connect to your garden and shower hose effortlessly. Besides, this unit comes with a simple mechanism that allows you to soak, rinse, and scrub your pet by injecting water deep into the fur for thorough cleaning.